If you raise or own horses, then you need the best housing for them as you can get and Action Sheds Australia features some of the best Durastall stables and arenas. In fact, our products were used in the 2000 Sydney Olympics for the Sydney International Equestrian Centre. Not only do we have high quality and the best safety ratings by industrial and national standards, but all of our stables, arenas, and sheds are highly customisable, making them tailor-made to fit your needs perfectly. This makes them the best possible option for you! Our stable kits are designed to be built into an already existing building, most likely a barn or other large garage-like shed, and yet still stand free. It is also a good idea to build on into an arena so as to have both your horses and their range closer in the same complex. These stables generally come in kit form, but at request we can build it for you on site, wherever you are. We even ship to anywhere in the country! Our equestrian arenas are available in different forms, including open roofed, partially enclosed, or fully enclosed. Depending on your design, width and length are also custom, as are any extra features you’d like to add. These features include railings on the sides of the arena, sky lights on the fully roofed arenas, and insulation for protection against the cold during the winter and heat during the summer. You can construct your arena in a variety of colours as well, especially those from our Colorbond cladding pallet, which include beautiful water and earthen tones. These arenas are also useful for other purposes besides equestrian ones, including to roof parks, school playgrounds, mining sites, loading areas, and virtually any other open area. 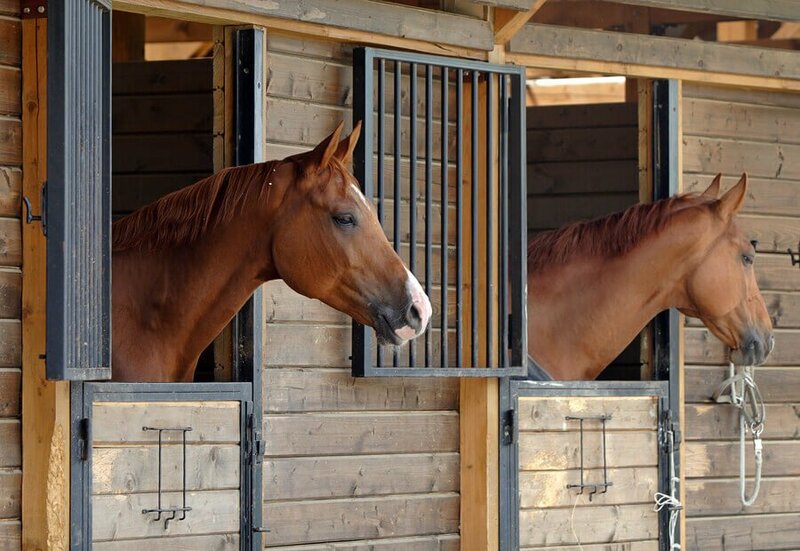 All of our stables and arenas can be designed according to your dimensions and are made with the high-quality Durastall 100% galvanised steel, allowing for maximum rust resistance. The new Durastall Series 4 Panels are available upon request. We also include a powered warranty for the structure and cladding of our stables, arenas, and storage sheds that have a warranty of ten and fifteen years respectively. If you have any questions about our stable and arena options and construction, call us at 1300 778 628.